Broomieknowe Golf Club was founded in 1905 and the club’s original course was a full 18-hole affair, designed by Ben Sayers, the North Berwick professional. Sayers was quite a character in his day – he’s said to have trained as an acrobat before becoming a golf club maker and professional player – and he’s recognised as one of the best golfers of his era to never win an Open, with an impressive ten top 10 finishes in 34 attempts. The authors continue: “On the fairly even land near the clubhouse there are six holes, three out, three back, parallel to each other. Braid kept five of them, providing a new tee for his new 18th, the present 16th. The other twelve lay on the other side of a track, on far more interesting land, giving ample scope to Braid’s imagination. With only one exception, all these had new tees, and eight had new greens”. When the A7 bypass was constructed in 1992, architect Martin Hawtree was tasked with remodeling the layout and he retained most of the Braid holes and five of his greens. He also created five new holes (from the 5th to the 9th) and re-sequenced the course to accommodate the new changes. Extensive drainage work was carried out at the start of the new millennium, allowing Broomieknowe to remain open when other courses in the area are waterlogged. Today, the course extends to 6,172 yards from the back tees, with only one par five (at the 8th) and three par threes (at holes 5, 11 and 15) on the scorecard. 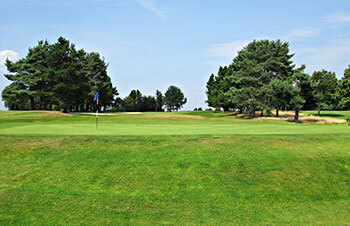 Holes 6 and 7 (“Marys Dyke” and “Cockpen”) form a formidable pair of par fours on the front nine but the degree of difficulty here is more than matched by the trio of two-shotters on the inward half at holes 12 to 14, which attract stroke index values of 1, 5 and 3. We played Broomieknowe during our stop at Edinburgh in May. Very nice guy in the Pro shop, but playing this short course from the whites is a privilege only granted to the members of the club (?). After three rather straightforward par 4's, the course opens up, throwing some more serious golf challenges at the players. Course design never gets exceptional, although the holes round the turn are noteworthy. Last three holes are OK-ish, but they are a bit of a underwhelming finish to a nice round of golf. Maintenance was OK, but I expected a bit more from the quality of the greens. Within the friendly and typical 'members' clubhouse, members have their own private room with a separate bar, which makes the general area a bit uninviting for guests after their round. Given the length of the course, it must be a fun course for playing matchplay with your buddies on a Summer's afternoon. Because of the number of golf-venues near Edinburgh, I/m not sure I will pick Broomieknowe next time. The opening and closing three holes at Broomieknowe are nothing to write home about, with all six par fours running parallel to each other on rather a flat piece of land close to the clubhouse. In fairness, the 3rd is a decent hole because it at least doglegs right to the green and the short home hole has been restyled with an offset tee set at a 30 degree angle to the fairway. It’s all pretty sedate and straightforward on these holes so the real golfing action takes place between the 4th and the 15th holes. On the front nine, the all carry par three 5th is a wee beauty, the left doglegged 7th is a really tough hole, veering downhill towards the green, whilst the slightly uphill 9th is a brilliant short par four, its green perched upon a ridge that runs through that part of the course. The stretch from hole 12 to 15 is easily the best at Broomieknowe, with holes set out on really tumbling terrain: a lovely wee wall runs along the side of the 12th as it approaches a big dip in front of the green, the 13th plays downhill to a wonderful bathtub green, the 14th returns back up the hill to a putting surface that’s protected to the front right by sand then the 15 plays as a beautifully bunkered par three. What surprised me most at Broomieknowe was the quality of the turf underfoot as I was expecting lush parkland fairways. Instead, I found what resembled heathland conditions, with a springy surface that was very well drained and almost links-like in character, especially around many of the green surrounds. Not the quite the same test as the medal tees when played off the yellows (over 400 yards shorter at 5,745 yards versus 6,172 yards and rated one stroke less than par), Broomieknowe was a joy to play nonetheless and well worth a try if you’re in the area and looking for a decent game of golf.